You can load these maps on your smart phone or other mobile device to see where you’re at all times! Use the free Avenza Maps App to use these maps and have GPS functionality. 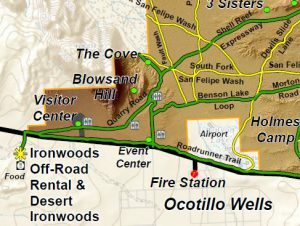 The map and app allow you to explore more of Ocotillo Wells without worrying about getting lost! Your GPS enabled mobile device will show your location even where there is no cellular coverage, just make sure to get setup before you ride. 1. Go to “App Store”, search for “Avenza Maps” and install, or click here. 1. Go to “Play Store”, search for “Avenza Maps” and install, or click here.